>The most important rejection I ever received. This wasn’t my first rejection letter; it wasn’t even my first personal rejection letter, but it’s the most significant one. It would be another six years before I sold my first story to Karen Joy Fowler for the Mota: Courage anthology, but one letter with a little praise and some very important criticism from Algis Budrys (whose few novels , which seem unjustly forgotten, I have always adored and admired) kept me going a long long time. This first paragraph was Budrys’s standard rejection template, I have a few other that say the same thing, so it rocked me to see the three paragraphs that followed. 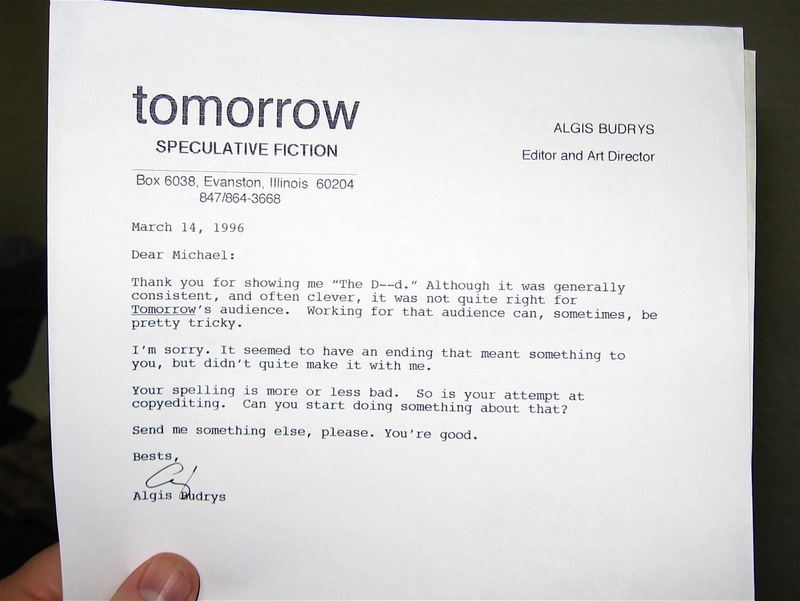 Budrys wrote rejections that were turning points in the careers of many writers. Stephen King, in On Writing, wrote about one he received when Budrys edited F&SF.